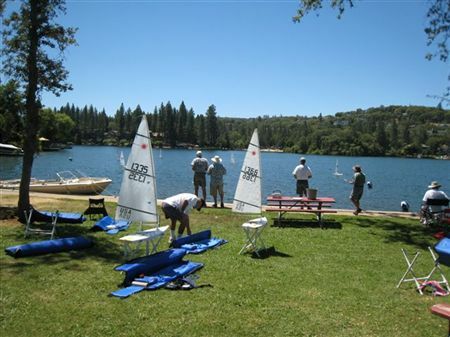 Lake Wildwood, Penn Valley, CA, is a gated community of approximately 3,000 homes, surrounding our 300 acre RC Laser sailing lake. It is nestled in the Sierra Nevada foothills at 1200 feet, approximately three hours from San Francisco, two hours from Reno NV, and fifteen miles west of Grass Valley CA. 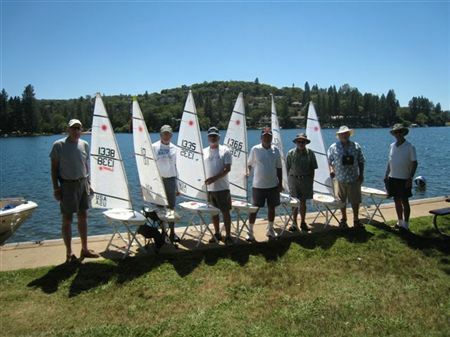 Launched: April 2003 with the procurement of 13 Lasers by Chuck Stice and Steve Elsner, to establish a one-design, radio controlled sailing class for racing, comradeship, and dedicated to the promotion of RC Laser sailing in Northern California. The Lake Wildwood Lasers also conduct races accommodating other R/C sailing classes, utilizing a handicap rating system. Located: Penn Valley CA. Our race committee boat and start/finish lines are located at Vista Park. Guests should call a member, in advance, to be cleared through the gate. The Fleet meets every Thursday at noon, weather permitting. Races start at 12:30. The last race usually ends about 3:30. We offer a variety of courses to match wind conditions and utilizing all points of sail. A handicap starting system is used to allow newcomers and guests to acclimate them to the local wind and course conditions. We utilize fixed and portable racing marks.